In my previous post, "Creating a GraphQL API with AWS", we walked through & learned how to create an AWS AppSync GraphQL API using the AWS Amplify library. Right now, the configuration for the API is set to API Key. This means that any client that has the correct API Key sent as a header with the http request will be able to access the API to perform operations against it. We would like to update the API so that only authenticated users can access it. We&apos;d also like to add fine-grained access conrol so we can control access to certain data based on the signed in user. With AWS AppSync, we can either use Amazon Cognito User Pools or OpenID Connect to accomplish this. OpenID Connect (OIDC) Authentication type enforces OIDC tokens provided by an OIDC-compliant service. Your application can leverage users and privileges defined by your OIDC provider for controlling access. This allows you to bring your own or use an existing identity provider to authenticate against your AppSync API. Amazon Cognito User Pools Authentication type enforces OIDC tokens provided by the user pool being used. Your application can leverage the users and groups in your user pools and associate these with GraphQL fields for controlling access. With the AWS Amplify CLI we can create a new authentication service & also update the authentication configuration of the AWS AppSync API we have already created. Choosing the default authentication & security configuration as we have done above will automatically set up some basica configuration around the authentication service, including email MFA for signing up, & requiring username & password for signing in. Now, the authentication service is in our account & we can begin logging in! If we sign up & then sign In, we should then be able to view the main application. If you would like more control over the configuration & design of the withAuthenticator HOC, you can view the documentation here to see what available props can be passed in order to customize it. If you would like full control over the design & configuration of your sign in screen, use the Auth class which has over 30 available methods that allow for full control over your authentication flow. Now that we have authentication set up we need to update the authentication type of our AWS AppSync API. Right now it&apos;s set to API Key, we need to update it to use the new Amazon Cognito User Pool configuration we just created. Now, our API will only be available to signed in users & not accessible via regular API calls from unauthenticated users. To test mutations & queries from the AppSync console query editor you will need to specify an app client & log in using that app client. To create an app client, go to the cognito user pool dashboard in the correct region, click on your user pool, & then click on App clients in the left hand menu to create a new app client. Make sure that Generate client secret is unchecked when creating the new App client. Now that we have an authenticated GraphQL API, we may want to start implementing some authorization controls on the API. Typically, you&apos;ll have resources that you only want made available to certain users or certain groups. Let&apos;s update our existing API to only allow the listRestaurants query to return the data of the logged in user. In the request mapping template for the createRestaurant mutation, we will update the data being passed in to the mutation to include information about the user creating the mutation. We&apos;ll add another field in the table (userId) & populate the field with the user id of the user that is triggering the mutation. We&apos;ll accomplish this by updating the input field with an additional value that we&apos;ll get from the user&apos;s identity using the $context.identity value available in the request mapping template. We&apos;ll create a userId global secondary index in our table so that we can query only based on that index. This means that we can request data only if the index value matches the index that we are querying for. (To learn more, click here). Now we need a way to query for the data based on the user. In the response mapping mapping template, we&apos;ll use the secondary index to query only for the data that the user making the request created. We&apos;ll read the user&apos;s unique id in the request mapping template & query based on the value. We&apos;ll get the user&apos;s identity by accessing the $context.identity available in the mapping template. We&apos;ll first update the request mapping template for the createRestaurant mutation. To access this mapping template, go to the AWS AppSync console & open your API. In the left hand menu, click on Schema. While in the Schema view, you will see the resolvers listed on the right hand side. Scroll (or filter) to mutations & click the resolver for the createRestaurant mutation. To see a gist of the new request mapping template, click here. Now when we create a new item, the user id of the user will also be stored along with the other item information. We now would like to query the table based on this new userId field. To do so, we&apos;ll create a secondary index on the table so that we can query this index based on the user id. To add a secondary index, we need to open the DynamoDB table for the API. Click on Data Sources in the left menu & then click on the link for the DynamoDB table. Next, click on the Indexes tab & click Create index. Set the Partition key as userId & the read / write capacity units to 1 & click *Create index *(it may take up to 5 minutes for index to be created). Now that the secondary index is created & the user&apos;s identity is being stored in the database, we can query based on the user&apos;s identity. To do so, we&apos;ll update the request mapping template for the listRestaurants query resolver. In the updated request mapping template we are performing a query based on an index instead of a scan. We&apos;re querying the userId index & getting the user&apos;s unique id from the context.identity.sub value which is automatically made available from AppSync. With this updated mapping template, when we call the listRestaurants query we&apos;ll only get the data for the user that is currently signed in. 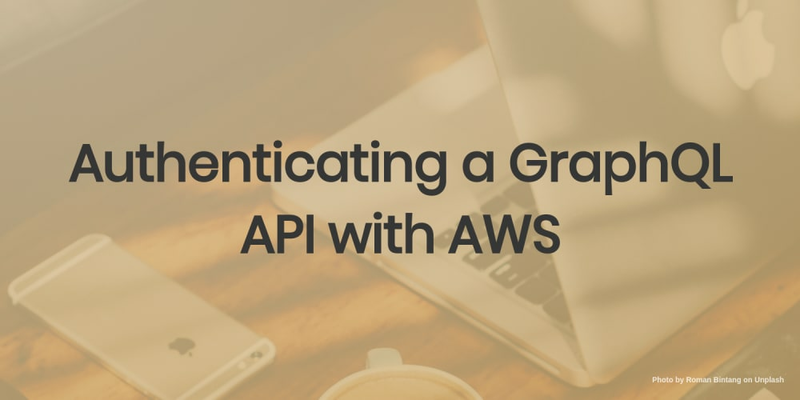 While we&apos;ve just scratched the surface of how you can implement authorization in an AWS AppSync GraphQL API, we&apos;ve covered some very important fundamental concepts that can be expanded upon to handle many authorization & fine-grained access control use-cases. If you&apos;d like to learn more, take a deep-dive into the AWS AppSync Authorization Use Cases documentation here. Create a serverless GraphQL API with AWS and consume it with React.